With limited space available, our clients in Keilor East wanted to transform their backyard into a family friendly entertainment space. They wanted to be able to utilise the space regardless of the time of day or season. We worked closely with our clients to create a multi-zone entertainment area with varying depths and textures throughout. Due to a severely sloping site, a concrete retaining wall was installed to make use of as much space as possible. Lilly Pillys were planted in the garden bed atop the retaining wall to provide screening and privacy. This plant variety is a great option as it is quick to grow, providing the desired screening and privacy. The glossy green leaves create a great 'green screen' backdrop for the major elements of the garden to provide a soft, welcoming contrast to the surrounds. At the foot of the retaining wall, a fibreglass pool was installed within close proximity to the neighbouring fence to ensure that the available space was used effectively. 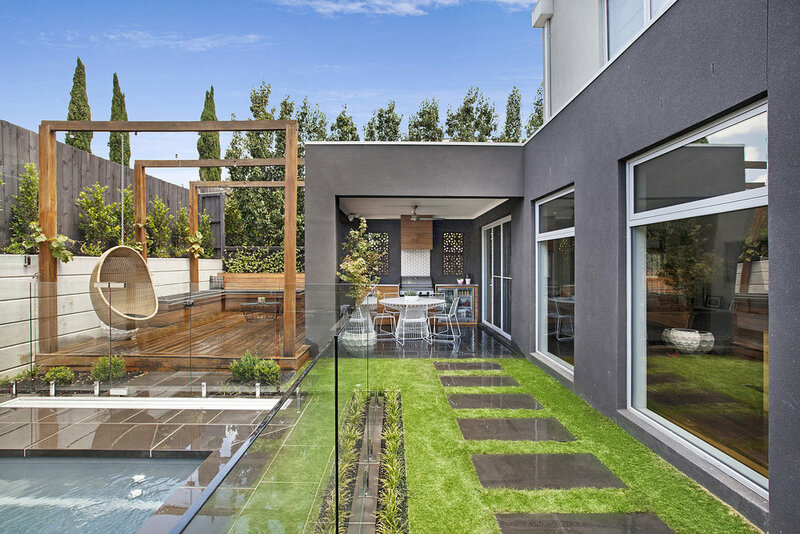 Frameless, glass pool fencing was chosen to make the small space flow as seamlessly as possible. It offers the security needed and, at the same time, doesn’t close the space in. For all season entertainment, a fully functional outdoor alfresco kitchen was installed complete with a custom built kitchen with bar fridge, range-hood and tiled splash-back. Custom laser cut decorative screens were installed in the alfresco area to provide texture, a wind-break and subtle decoration to the space. The use of the white tiles in the splash-back provides texture and ties in with the white in the concrete retaining wall, while, at the same time, contrasting nicely against the natural bluestone pavers. The placement of white accent pots and white out-door furniture in the alfresco area add further interest and character. Contact us today to disucss your landscaping needs.